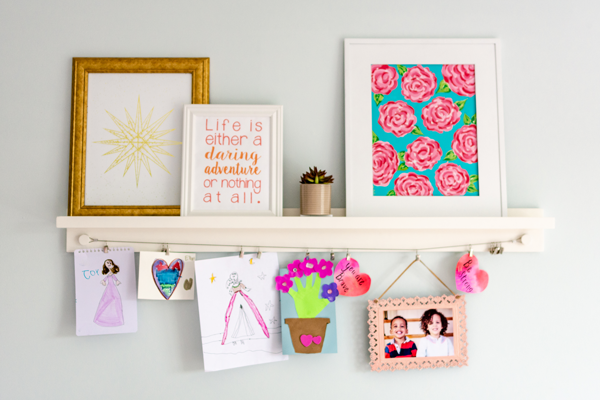 Discover 7 New Adorable Ways to Display Kid's Art! 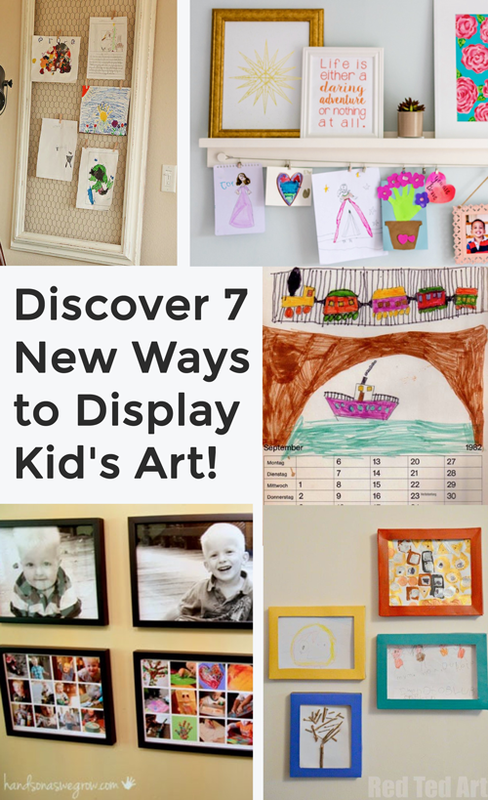 Discover 7 New Ways to Display Kid’s Art! Although some days I want to roll my eyes and say “I’m not in the mood to do another artist today” I don’t want to stop her creative spirit. 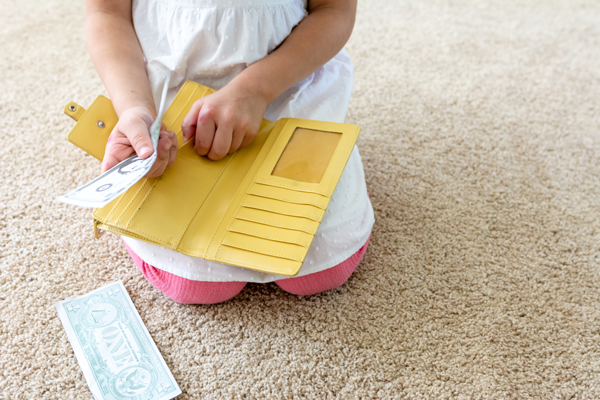 Our kids also love pretend play. Through the last year we’ve made a Doc McStuffins Doctor’s Office, a flower shop, a food truck play center and a coffee shop. Our Pretend Play Art Gallery! A few weeks ago, it finally hit me, why don’t we make an art gallery in our play room? A place where we can display all my daughter’s art and turn it into a dramatic play center. So that is what we did! You will find unique ways to display kid’s art at the end of the post. But first I want to share our art gallery pretend play. This post contains affiliate links for products we love. We had our first art show in our play room! My daughter wanted to charge everyone 2 dollars to enter. We made this fun sign and we were her first visitors. She wrote out our tickets and took our $2. After everyone was checked in. She gave us a tour of the art gallery. Explaining each piece and what it meant. Then we were able to purchase her artwork! We wrapped it up with a personal drawing session. 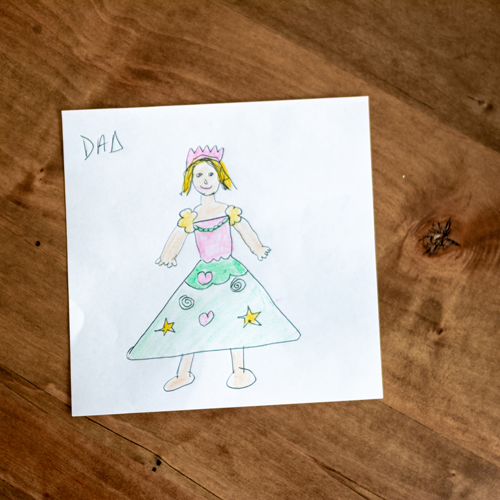 She taught daddy how to draw a princess. It was honestly so much fun for the whole family. She couldn’t wait to do it again and make more art to sell to her fans. 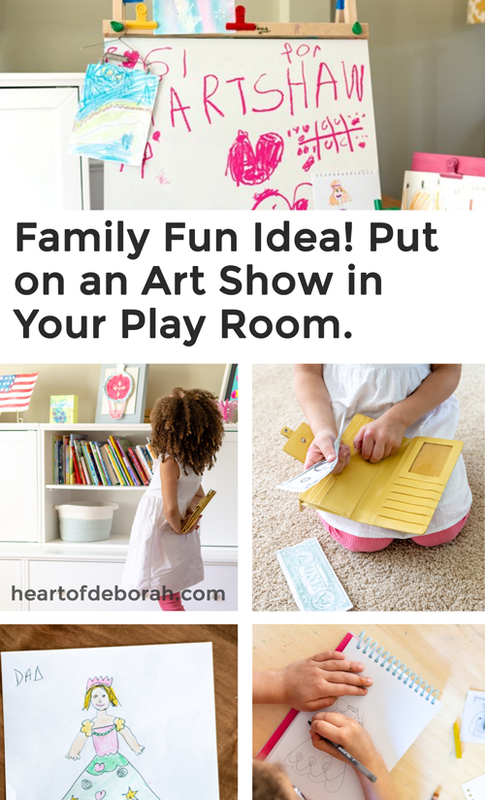 Because we have an artist in house I wanted to share 7 fun and unique ways to display kid’s art. We will have a lot to display over the years! 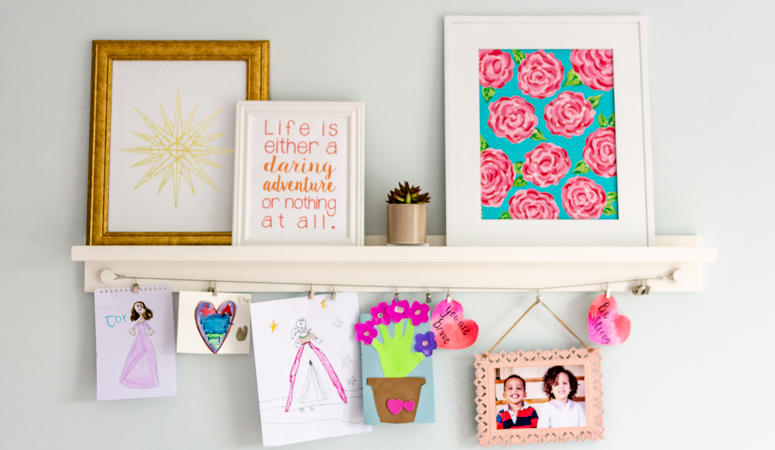 7 Unique Ways to Display Kid’s Art! One: We absolutely love this shelf in our daughter’s bedroom. 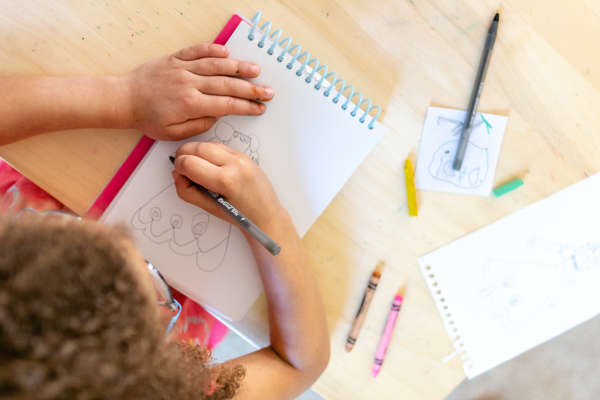 It is perfect for little artists! She loves to pin up her own original artwork. See more about the shelf here. Two: How adorable are these cereal box picture frames? Maggie from Red Ted Art made these and I think they are adorable. 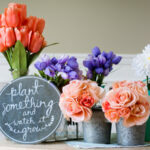 A great way to recycle and they are super easy to make. Three: Another perfect way to preserve all that art? Make it into a kid’s art calendar. Another genius idea from Red Ted Art. What a fun gift this would be to give to parents or grandparents with all original kid art! Four: This idea from Hands On As We Grow is also brilliant. She takes photos of her children’s artwork and makes collages. 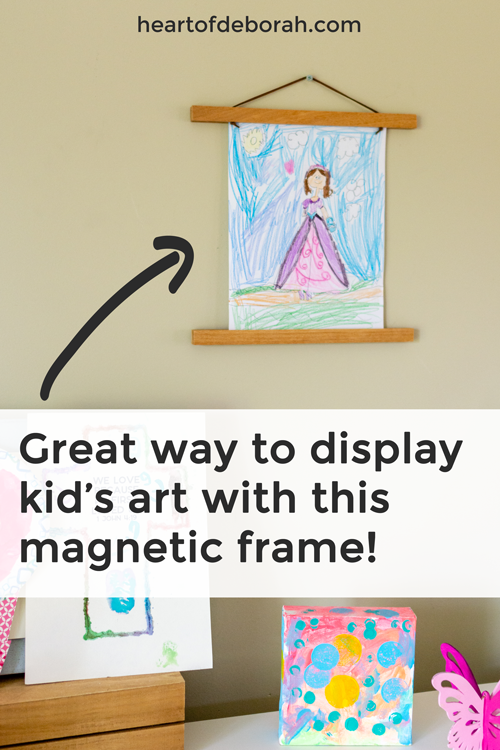 See more details about this unique way to display kid’s art here. Five: We decided to make a daughter’s artwork as part of our play room decor. I love decorating with meaningful pieces and what better way then to frame art or use a display stand? 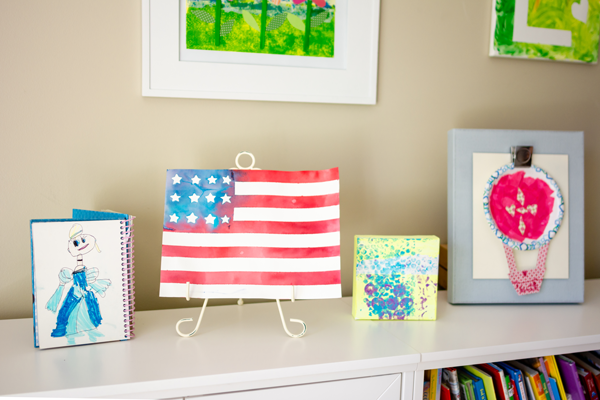 I love this American flag watercolor displayed in our play room. Six: This chicken wire framed art board is amazing. The frame itself is beautiful and pin your favorite artwork to it to create the perfect customized look. From girl inspired! Seven: I recently purchased this magnetic frame hanger from Amazon and it is so prefect. My kid’s love that it is magnetic and they can easily swap out their artwork for new pieces. It’s an easy to use frame. So how about you? 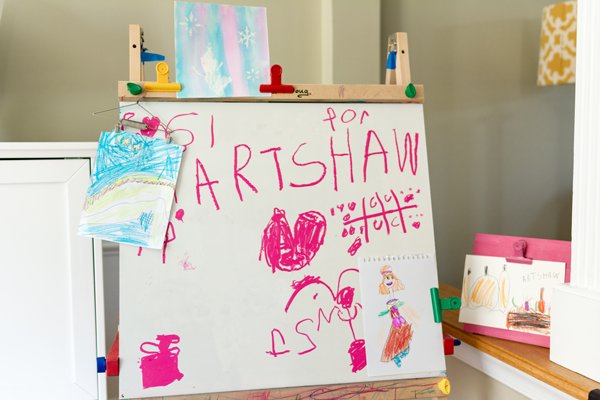 Do you display your children’s artwork all over the house and fridge? I’d love to hear from you in the comments below! 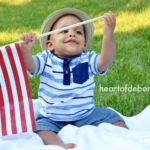 The 7 Cutest 4th of July Crafts & Activities for Kids!